After my relatively feeble attempt at winter dirt bike riding I started looking at different options to enhance the experience that I had. The riding that I did included basically 2 very different terrain challenges. I found that riding in 6" to a foot of powder was no problem and very fun. The bike would accelerate pretty well although I found I wanted to run through the gears pretty fast to get the rear tire roosting in order to really get the bike to move like I wanted it too, a lot like you would in sand. I found turning to be pretty easy also, you just had to be a bit more conscious of the bike slipping out from under you. The second terrain I rode on was hard pack snow and ice on the main roads. This was MUCH harder, it took two spills before I realized I just wasn't going to be able to ride on this stuff. I couldn't accelerate or turn with any confidence or success. Normally I wouldn't have seen a need to ride in the snow since you can usually find a place to ride with very little snow in the deserts of Utah, even in the dead of winter, but this has been a big snow year for Utah. The picture of me above was taken on our locomotive spring's trip in January. I found basically two ways to improve your bike for snow riding. 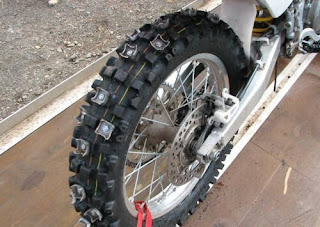 The first is studded tires, and the second is a track system that sort of turns your dirt bike into a snowmobile. Here are a couple different ways to get studded tires. The first way is to make them yourself. 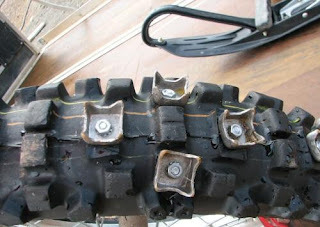 You can purchase ice screws like the ones shown at mfgsupply.com or most motorcycle dealerships. 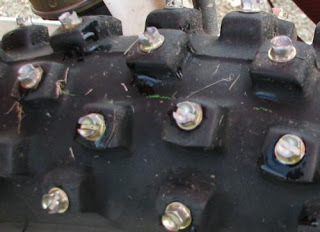 For the type of riding I am interested in doing, I would assume that studs such as these would be enough to provide the traction needed. 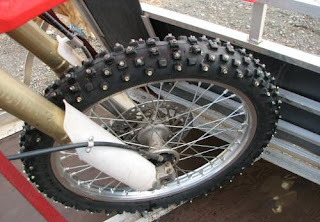 Below is another option for a rear tire. These are 1" snomobile ice studs that are fitted on to the tire using nuts and bolts. The knobs are cut 3/4" away to leave room for the studs but still leave enough knob for strength of holding the knob. Just make sure there is enough room for the studs as it rotates so you don't chew a hole in the swingarm! If your tire is back far enough initially you won't need to worry, but if it's already close you may need to add a longer chain and move your rear tire back for the addition of any type of stud. The last option I mentioned was the snow track conversion. 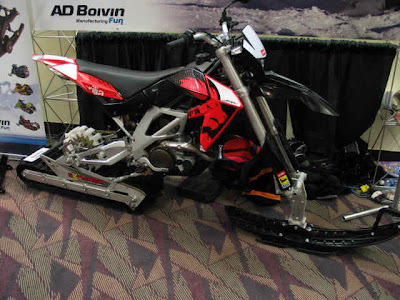 I believe this would be overkill for most people since the kit costs more than most of our bikes cost, but it is still less than a snowmobile and it's still more "bike like" than a snowmobile (it's still your bike!) These usually cost around $3,000 to $5,000 and are best suited for big bikes with big power although they say a minimum would be a 250cc 2-stroke or a 400 4-stroke. The kits pictured are from snoxcycle.com . I don't believe I would consider these kits an option for me unless I was interested in going into the deep snow in the high mountains during the winter. Since there is better riding in the deserts with less snow, why spend the money? They do however, look like a blast to ride, they are lighter than a snowmobile, cost less, and you don't have to own two separate machines for winter and summer. A couple more track options have been popping up lately. One is the Explorer System pictured below. 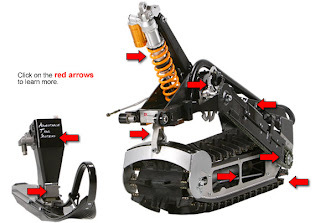 It uses a cog to drive the track directly and bolts on to the stock swingarm. The rotation of the drive must be reversed before getting to the drive cog in order for the bike to move in the right direction. The last, and perhaps the best option comes from 2moto. Although the most expensive in the group, it is the most complete system replacing the entire swingarm. It has also been a proven performer in the world's first ever Snow Bike Race . Below are a couple pictures of the system. More information can be found by clicking on the track image.